A pastel drawing of Exeter cathedral South East. Claude Buckle. 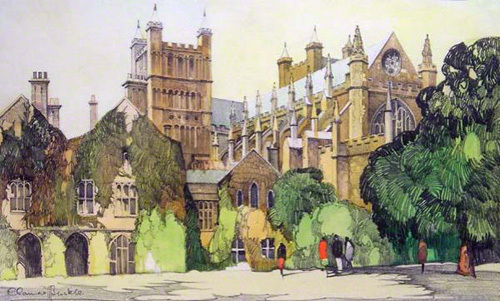 A pastel drawing of Exeter Cathedral from the South East by Claude Buckle. This is an early sketch of the Cathedral which formed the basis for the later water colour carriage print. This is pre-war drawing made in the early 1930's. Claude Buckle painted a number of pre-war pastel, pencil and charcoal drawings which were later developed into posters and carriages prints in the 50’s. Created in 1931.